French soldiers from the Wagram Task Force kneel next to a CAESAR unit, a French self-propelled 155mm howitzer, north of Mosul on July 13. 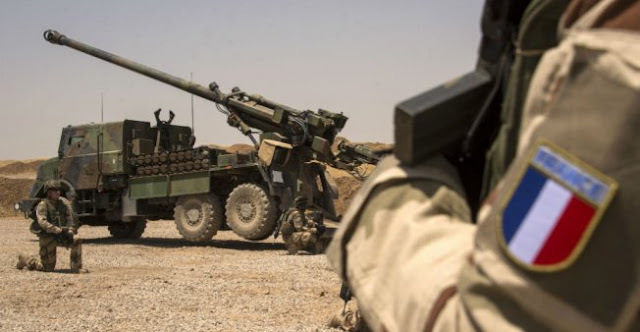 A French soldier from the 13th regiment of paratroopers was killed this morning while fighting in the Iraq-Syria region, the French presidency announced on Saturday. The Élysée Palace office of President Emmanuel Macron said in a statement that the president had "learned with great sadness" of the death of a soldier who was killed in combat in the Levant this morning. The French military operation in Iraq and Syria, known as Opération Chammal, is part of the US-led coalition of nations battling the Islamic State group. Military sources told AFP that it was the first French casualty since Chammal was launched in September 2014. French forces are involved in several overseas military theatres while a major domestic military deployment also remains active as part of anti-terrorism measures under Opération Sentinelle. The Élysée statement said that the French president "salutes the sacrifice" of the soldier, who Macron said was killed while pursuing a mission "to defend our country, protect our fellow citizens and win the struggle against barbarism". The president also expressed "his confidence and his pride in the French soldiers who fight with courage and sacrifice against terrorist groups from the Levant to the Sahel" in Africa.